We Aussies know that our land is girt by sea, and filled with hilarious talent. While some of our comedians have stayed home, others have gone for far-off locations – and made their mark. Here’s three of the hottest Australian comedians in the UK right now. Most people in the UK have heard of this Australian legend. The disabled comedian has no qualms about showing his prosthetic leg and that confidence makes him hot. He currently co-hosts ‘The Last Leg’, which focuses on the news and politics in the UK with a humorous twist, but he has also performed stand-up gigs, toured Australia with his TV show co-hosts, and been on numerous other UK comedy shows. Born in England to Australian parents, but then raised in Perth, it’s no wonder Tim has found success back ‘home’. Aussies and Brits now call him their own, which is why he spends his time in both countries, when he’s not globetrotting for work. Not just a stand-up comedian, Minchin performs parody songs, writes his own music, and has made numerous TV appearances. He has recently written the music for comedy stage production Groundhog Day, which remains on Broadway until September 2017. Felicity Ward is best known for some of her Australian TV appearances, but she has become popular in the UK since her appearance in The Inbetweeners 2. She has stand-up comedy dates planned in London and Portsmouth between June and November 2017. While sharing her ability to make people laugh, this stand-up comedian is a strong advocate for mental health, after sharing her fight with anxiety. Who are your favourite stand-up comedians from Australia? « Previous Story What Ever Happened to these Famous Comedians? 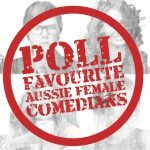 Next Story » Who is your favourite Aussie female comedian?